This page covers the various managers included in the Corgi Engine and how to tweak them to your needs. The Corgi Engine uses managers as central reference points for a lot of classes and components. These managers, always present in your scene, will remember the current points count, the sounds that are playing, or where to spawn the character. There are a few of them, and in most scenes you’ll have a Game, Level, Input and Sound managers present at all time. Usually you’ll want to place them on empty gameobjects. Their position in your scene doesn’t matter, they’re invisible anyway. It’s good practice to put them out of the way of your level so you don’t delete them by accident. The Game Manager is a high level manager that is responsible for setting the target frame rate, storing the points, handling the timescale, and remembering where on the level map the player was last time. It can also optionnally handle the lives system, defining how many lives the player can have, and how many it has right now. In this case you’ll have to specify a game over screen to redirect the player to in case all lives are lost. In most cases you won’t have to interact with it, but make sure there’s one in your levels. The API documentation is a good place to go to if you want more information about it. Note that there’s also a Multiplayer Level Manager, which does pretty much the same thing, but for multiplayer levels. In most cases you’ll want a LevelManager in each of your levels. It needs to be on its own gameobject. From its inspector you can (and should) set what prefab to use as the player. To do so, unfold the PlayerPrefabs dropdown if it’s folded, and just drag a prefab from your project view into the Element0 field. 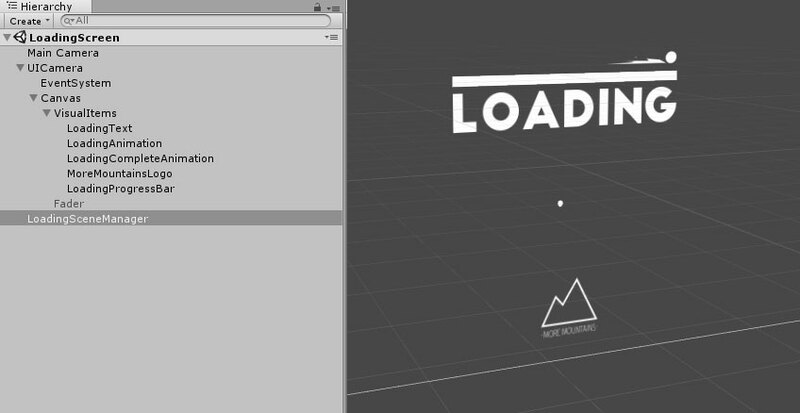 If you’re in a multiplayer level, set the size of the PlayerPrefabs array to more than 1 and repeat the process. For more information about the “Auto Attribute Player ID” checkbox, check out the Input page. You can also define a debug spawn (drag one from the scene view, or click on the little dot at the right of the field and select one from the popup window that will open). This debug spawn will be where your player will spawn while in editor mode (useful to tweak the end of a level for example). 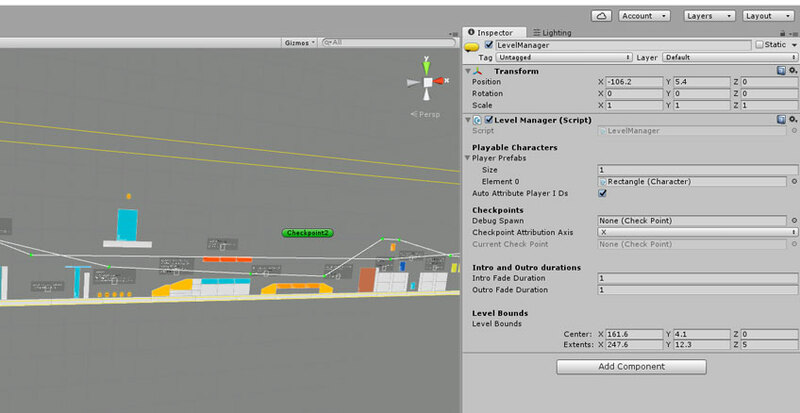 The level manager’s inspector is also where you’ll be able to set the level bounds. They’re the limits of your level, your camera won’t go beyond that, and in most cases neither will your character. To set that up, just set the center’s position, and change the extends of the bounding box. You should see the bounding box in yellow in the scene view. The Level Manager will also allow you to setup your level as a One Way Level. One Way Levels are levels where you can’t go back where you come from (think early Mario levels for example). To do so, from the LevelManager’s inspector, just select any One Way Level Mode other than “none”. You can chose between Left, Right, Top or Bottom. These are the directions the player won’t be able to go back to. What this will do is add, when the level starts, an invisible collider that will follow your player and prevent it to go back. In addition to that, the camera will also be constrained by this collider, as if it was the Level Bounds. From the inspector you can also set the distance that collider should be from the player, its size (make it bigger than your character), and whether or not it should kill the player when it collides with it. While all the other managers mentioned on this page are generic, there is no generic Progress Manager. You’ll find an example of it in the RetroAdventure folder. The progress manager is responsible for saving and loading progress across levels. The reason why there’s no generic one is that it wouldn’t make much sense, as all games will by nature have different needs when it comes to saving stuff. You can either copy this one into your own progress manager, or extend it if your needs are close enough. The Retro Adventure Progress Manager uses serializable classes to save data to file and read it later. It waits for LevelComplete events, and when it gets one, it saves what level’s been saved, which ones are unlocked, how many lives are left to the player, and how many stars (and which ones) were collected. When combined with the inventory and achievements systems (which handle their own save/load mechanisms), you’ve got a complete solution to save all progress in your game.